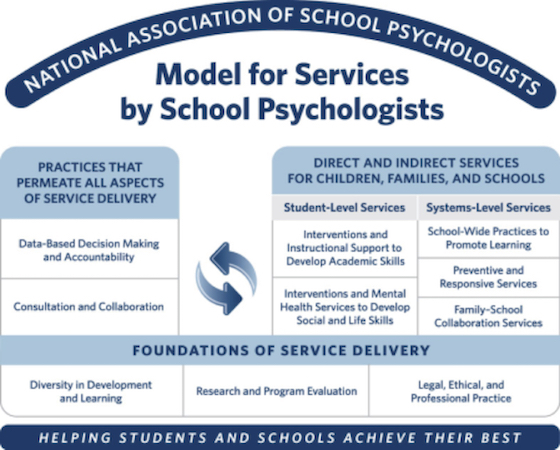 The NASP Model for Comprehensive and Integrated School Psychological Services (PDF), also known as the NASP Practice Model, represents NASP's official policy regarding the delivery of school psychological services. It delineates what services can reasonably be expected from school psychologists across 10 domains of practice, and the general framework within which services should be provided. The recommended ratio for schools implementing this comprehensive model is one school psychologist to 500-700 students. Implementation of the NASP Practice Model creates the capacity to make the best, most cost-effective use of school psychologists' skills and expertise, which are an existing but sometimes underutilized resource in schools. The Practice Model allows flexibility for agencies and professionals to develop policies and procedures that meet local needs, while also providing sufficient specificity to ensure appropriate, comprehensive service provision. The Organizational Principles describe the things that need to be in place in school districts to support effective delivery of the domains of school psychology practice. Full implementation of the NASP Practice Model is most often a multi-year process, particularly in states and districts that must build toward the recommended ratio. However, adopting the model as a framework for school psychological services and aligning personnel evaluations (PDF) and professional development with the model allows school psychologists and district leaders to make progress toward comprehensive service delivery.